What has happened to this once-beautiful city since the Arab Spring? It seems odd that six years ago Aleppo, in north-eastern Syria, was a hugely populated city renowned for good food, historical artifacts and tourist-friendly adventure. Watching the recent horrific footage coming from the area, it’s difficult to imagine how it could have been such a vibrant, livable city before the Arab Spring uprisings of 2011. For two weeks in 2014, VICE News was embedded with the Islamic Front and bore witness to their battle against the Assad regime. The result was Ghosts of Aleppo, an eye-opening documentary film. Before you watch, here’s a brief primer on what has happened to the city first settled in 5000BC, and now a ghost town. As the euphoria of the Arab Spring devolved into civil war in Syria, Aleppo became a strategic base for various rebel factions. It’s important to mention here that there has been no solid, unified opposition to Assad that makes this a black-and-white war – instead, it’s more of a loose coalition of groups (some moderate, some...not) who sometimes fight among themselves. They took control of the poorer, eastern side of the city in mid-2012 while the government forces established a base in the western side. Suddenly a place that had been largely untouched by events so far had become a major battlefield. 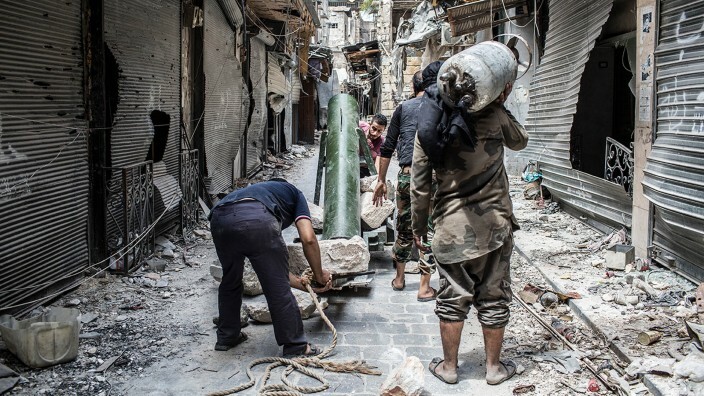 Few thought the conflict in Aleppo would carry on for four years when it erupted in 2012, and most hoped it would be free from the kind of tactics that saw sarin gas used on civilians (both sides blamed the other for this). According to leaked documents, Assad systematically used torture and the murder of captives as part of his military strategy, but slowly and surely, the tide was turning in the rebels’ favour. By mid-2015, conventional wisdom said Assad was on his way out the door. Unfortunately for the rebels, conventional wisdom didn’t factor in Russian realpolitik. By October, Putin had waded into the conflict on behalf of Assad, commencing air strikes against the rebels and supplying an array of military hardware that included warplanes, helicopters and artillery. 2016 saw bombing campaigns against the rebels continue, and militias from Iran, Iraq and Lebanon helped government forces surround them in a siege, cutting off access to food and medical supplies. By November, there were no hospitals left courtesy of a targeted campaign from Assad, and the Russians were dropping pamphlets promising annihilation to anyone who remained in the region. In mid-December last year, Assad announced that government forces had retaken the city. Across Twitter there were many messages of farewell from fighters who knew their time was up – as well as persistent rumours of the indiscriminate shooting of civilians, in accordance with those Russian promises. An evacuation deal was brokered by Turkey and Russia, then broken as shelling recommenced, then remade, suspended, remade and finally completed on December 22. With an estimated 31,000 people dead as a result of one of the longest sieges in modern military history, the Battle of Aleppo is one of the bloodiest battles of the Syrian Civil War. Assad’s victory marks a significant shift in fortunes and it seems likely that things will only get worse for the rebels from here. We have put a human face on these events with iconic photos of small boys like Omran Daqneesh and social media accounts from girls like Bana Alabed, and its important to acknowledge that this has been the largest slaughter of non-combatants the world has seen since the 2003 genocide in Darfur. Is toking on marijuana a sure-fire way to bring the smoker closer to God’s kingdom? Can religion and weed co-exist, or even work together? VICE’s Krishna is on the case. VICE News spent a month reporting from the volatile city of Mosul, where the Iraqi people fight to keep the Islamic State at bay. You can tell a lot about a culture from the way they let their hair down. In the Ukraine, we discover that a big night out is fraught with tension.